Forty years ago, nearly all of the state’s rural hospitals delivered babies, but today, that only happens in about 40 percent of those facilities. That’s because many obstetrics units are closing down. Nurse Jennifer Sanders had long seen trouble ahead for the birthing unit at St. Mark’s Hospital in LaGrange, which is about an hour east of Austin. “We heard rumors that they were going to be closing and we had a staff meeting probably about a year prior to the actual closure of the unit,” Sanders says. When it actually happened, Sanders lost her job and so did about a dozen other nurses. Sanders says she was devastated – and so was the rest of town of about 4,500. “The community, in and of itself, was in an uproar; they were very angry. People were trying to offer suggestions and by that point it was too late,” Sanders says. Sanders says the closure means many pregnant patients now have to travel an hour away to places like Houston and Austin for care and delivery. And the same is happening all over the state. Don McBeath is with the Texas Organization of Rural and Community Hospitals. “Over the last three to four years, I would estimate probably about 10 rural hospitals have ceased that service, and we’re at a point where only 68 of the 161 rural hospitals in Texas still deliver babies,” McBeath says. He says there’s a number of reasons for the unit closures, including increasing regulations and a shortage of doctors in rural areas. But a lot of it comes down to money, and McBeath says the biggest culprit is Texas Medicaid. “The state Medicaid plan, which is supposed to, per directives in the legislature … pay hospitals at cost for Medicaid patients, is paying them about 70 cents on the dollar,” McBeath says. McBeath says this is a big issue because Medicaid funds up to 70 percent of births in rural hospitals. “So, it creates a real problem if, in 70 percent of the deliveries, that hospital is losing, on every delivery, thousands and thousands of dollars. They can’t sustain that,” McBeath says. Money was one of the reasons that Rice Medical Center in Eagle Lake closed its birthing unit this summer. Of the 28 babies born there in 2017, Medicaid covered 21 of those births. Hospital CEO Jim Janek says after a three-year review, the hospital’s board decided the unit was just too expensive for the community’s aging population. “With the elimination of those services and the elimination of the need to have 24/7 specialized nursing, anesthesia and physician care, the hospital immediately saved a tremendous amount of money,” Janek says. Hospital officials at St. Marks in LaGrange also cited financial issues related to Medicaid. But nurse Jennifer Sanders says when her unit closed, just one doctor remained who could deliver babies at St. Marks. “Our deliveries dropped to probably around 18 to 20 a month, and that was a lot for her to handle since she was the only one doing it,” Sanders says. 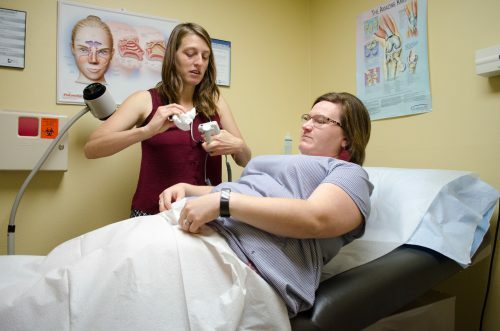 The Texas Organization of Rural and Community Hospitals says more than half of Texas counties have no obstetrician or gynecologist. University of Minnesota professor Katy Kozhimannil says there are consequences when smaller, more remote counties lose these services. Kozhimannil says a 10-year study she did about this issue found that in counties where obstetrics units were closed, there was an increase in babies being born prematurely. “That is really important because preterm birth is the largest risk for infant mortality, and we know from CDC data that rural infants have a higher infant mortality rate than urban infants, and this may be one of the reasons why,” Kozhimannil says. She says another problem is that women in these counties were going to fewer prenatal care appointments. “It stands to reason, if you have to drive much further to your prenatal care visits, you may be going less often,” Kozhimannil says. In the midst of these closures, Texas has also made headlines for it’s high maternal mortality rates. Kozhimannil says two things should be done to improve rural obstetrics: the first is greater financial support for the rural hospitals that still provide obstetric services. The second is to find a way to provide obstetrics services for women in counties that have lost units or just aren’t populated enough to sustain them. “We have all kinds of protocols in place for emergency cardiac care if you have a heart attack – we should do that for births,” Kozhimannil says. The Texas Legislature might address problems with rural obstetrics in the upcoming session, starting with Medicaid reimbursement rates – that’s something Democratic State Rep. Barbara Gervin-Hawkins of San Antonio has proposed in a new bill. Her aim is to create a committee that would evaluate reimbursement rates. But Gervin-Hawkins filed a similar bill last session and it never made it out of committee. This entry was posted in KRTS News and tagged obstetrics, rural hospitals, West Texas. Bookmark the permalink.